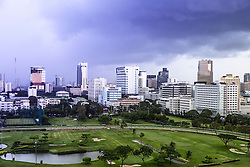 The Royal Bangkok Sports Club (Thai: ราชกรีฑาสโมสร Ratcha Greetā Samosorn) is an exclusive sports complex and the first golf course of Thailand, The number of members is limited at 12,500 accounts. Th total area is 88.90 acres. In 1890, Prince Devawongse Varopakarn, the foreign minister, was requested by Mr. Franklin Hurst, Englishman, to establish a race track and sports field. In 1892, Mr. Hurst was given a 15 year lease on Toong Sra Pratoom by the king and the club was formed as The Gymkhana Club and Race Course Society. In 1901, King Chulalongkorn established the Royal Bangkok Sports Club and took over the Gymkhana Club.